Besides churning out killer beers like Even More Jesus and Bozo Beer, Denmark’s Evil Twin Brewing has consistently plastered their bottles with interesting labels. From the bold and often humorous names to the almost fractal-like design, the bottles and cans from Evil Twin are instantly recognizable. We talked with Jeppe Jarnit-Bjergsø and Martin Justesen about the process for coming up with beer names and the art that goes with them. How do you guys come up the names for your beers? Specifically ones that are a bit different like “Christmas Eve at a New York City Hotel Room”? I come up with some of the names, my wife who is a copywriter comes up with most of them. Most of the names have some meaning, like we actually did spend Christmas Eve at a NYC hotel room once. We like not to take things too seriously and believe that more breweries should have more fun when naming their beers. A lot of beer names are very generic. How do you go about designing a label? We give Martin an idea, a taste of the beer and a look at it, and often a name and he creates a label from that. I’ll often start doing sketches when I hear the name of the beer. Usually, I have two or three design ideas I’ll work on. Sometimes the beer is part of a series and I’ll work out the all-over look of the series. Sometimes it’s a label that is made for a certain bar or restaurant and I’ll take that into consideration. 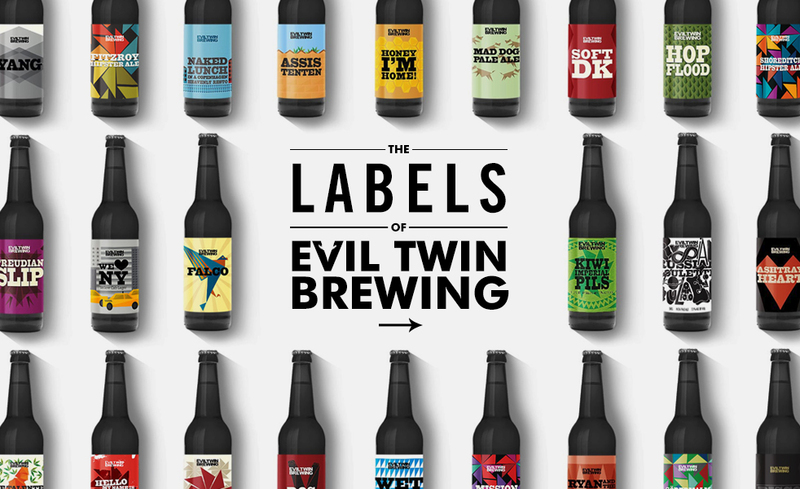 The look of an Evil Twin label is quite geometrical and graphic. Every label is built up by triangular shapes. I like for the labels to work on two levels, the first to grab your attention by standing out, and the second by containing details you later discover when you sit down and look at it close up. So do you guys work with any outside artists? You guys seem to have a lot of fun with the names and labels, was that a conscious decision? Yes and no. We decided we wanted to do things differently and it just ended up like this. Like we used a graphic designer while most other craft beer labels are drawings, we just wanted to differentiate ourselves. With the label text, my wife writes them, and I just told her you can write whatever you want just don’t talk about the flavor/aroma of the beer, too many labels describe the beer and it is boring to read, and who are we to tell people how the beer tastes, let them figure it out. Are any other breweries making labels you guys really like? Definitely. I like when a brewery makes labels that are all very different but you can always see where it comes from. Crooked Stave is one. Anything in the works you’re really excited about? Lots of things. I get new ideas for beers all the time and anytime we decide to actually brew one, I get very excited. Having an idea in your head, creating a recipe, and then waiting to taste the final product is what I like the most about what I do. The joy of a beer coming out exactly as intended is just awesome! Checkout Evil Twin Brewing for more.